Fittingly, the moment of her promotion was captured on video and shared on Instagram. “Misty, take a bow,” Kevin McKenzie, Ballet Theater’s artistic director, could be seen saying, before colleagues congratulated Ms. Copeland, who seemed to be fighting back tears. Her promotion was lauded on social media by, among others, Hillary Rodham Clinton and Prince, who had featured her in a video. Over the past year, whenever Ms. Copeland, 32, danced leading roles with Ballet Theater, her performances became events, drawing large, diverse, enthusiastic crowds to cheer her on at the Metropolitan Opera House, the Brooklyn Academy of Music and the David H. Koch Theater at Lincoln Center. After she starred in “Swan Lake” with Ballet Theater last week — becoming the first African American to do so with the company at the Met — the crowd of autographseekers was so large that it had to be moved away from the cramped area outside the stage door. 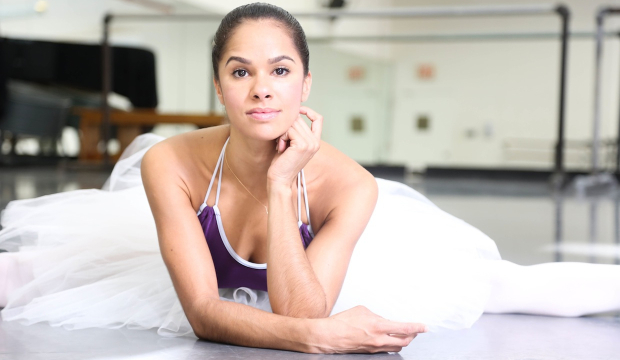 In a break with ballet tradition, Ms. Copeland was unusually outspoken about her ambition of becoming the first black woman to be named a principal by Ballet Theater, one of the country’s most prestigious companies, which is known for its international roster of stars and for staging full-length classical story ballets. She wrote about her goals and struggles in a memoir published last year, “Life in Motion: An Unlikely Ballerina.” A number of leading dance companies and schools, including Ballet Theater, have begun new efforts to increase diversity in classical ballet, but there is a long way to go. Jennifer Homans, the author of “Apollo’s Angels,” a history of ballet, said that ballet had fallen far behind other art forms, like theater, in that regard — making what she called the “phenomenon” of Ms. Copeland all the more important. “What she has come to represent is so important in the dance world, and in the ballet world in particular,” said Ms. Homans, who is the director of the Center for Ballet and the Arts at New York University. “I think it’s about time. But I don’t think it’s enough.” This history made Ms. Copeland’s chances for promotion a much-discussed topic in the dance world, and put a rare public spotlight on Ballet Theater as it weighed the kind of personnel decision that, in the rarefied world of ballet, is seldom talked about openly. That race could still be such an issue in 2015 — and that African-Americans could remain so rarely seen in elite ballet companies — has been depressing to many dancegoers, and has led to impassioned discussions in the dance world and beyond about race, stereotypes and image. Misty Copeland dances with Prince at a concert in 2010. The dearth of black women in top ballet companies has been attributed to a variety of factors, from the legacy of discrimination and lingering stereotypical concepts of what ballerinas should look like to the lack of exposure to ballet and training opportunities in many communities. More than a half-century has passed since the pioneering black dancer Arthur Mitchell broke through the color barrier and became a principal dancer at New York City Ballet in 1962, and a generation has elapsed since Lauren Anderson became the first African American principal at Houston Ballet, in 1990. But City Ballet has had only two black principal dancers, both men: Mr. Mitchell and Albert Evans, who died last week. Ballet Theater officials said that the company’s only African American principal dancer before now was Desmond Richardson, who joined as a principal in 1997.
principal in 1997. In ballet, principals earn not only the respect of the dance world but are also paid more, dance bigger roles and see their photos in programs, as well as their names in larger type. Ms. Copeland last seemed on the verge of promotion in 2012 after a breakthrough performance in the title role of Stravinsky’s “The Firebird,” but she was sidelined by injury. Ms. Copeland’s promotion was announced by Mr. McKenzie at a company meeting on Tuesday morning. Three other dancers, enormously respected in the dance world but far less famous outside of it, were also made principals. Stella Abrera, who has been a soloist with the company since 2001, was promoted, and two more principals were hired from outside: Maria Kochetkova, a principal with San Francisco Ballet, and Alban Lendorf, a principal with Royal Danish Ballet. Viola Davis says she regrets acting in "The Help"